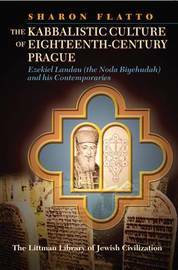 This is the first critical account of the life and writings of Ezekiel Landau, chief rabbi of Prague from 1754 to 1793 and one of the most significant figures of eighteenth-century Jewish history. His counsel was sought by a wide spectrum of rabbinic leaders, scholars, and laity, and his writings continue to shape Jewish law and rabbinic thought to this day. This study reconstructs the intellectual world of the traditional society in which Landau lived. In doing so it emphasizes the dominance of rabbinic culture in the city at this period, the importance of kabbalistic ideas and practices, and its numerous distinguished figures and institutions. In focusing on the city's vibrant rabbinic culture and analysing the spiritual trends that animated it, it demonstrates that Prague's late eighteenth-century rabbinate was more influential, more conservative, and less open to modernization and Haskalah than previously recognized, and shaped more by eastern European Jewish culture rather than by Western influences. Landau is best known for his authorship of the rabbinical responsa published as Noda biyehudah and is generally seen as staunchly opposed to esoteric practices. This study challenges that view, exposing the central importance of kabbalah in Landau's works and thought and showing that he frequently blended teachings from diverse kabbalistic schools and trends in a syncretic and original manner. It also identifies the factors underlying his reluctance to discuss kabbalah publicly. Instead of focusing solely on the history of events, this work examines the ideas that remained widespread among Prague Jews despite the tumultuous times in which they lived. Landau devoted much of his career to shaping the values and practices of his community and frequently tailored his works to their needs, beliefs, and mentalities. Accordingly, his writings and numerous other contemporary sources provide us with a unique glimpse into the spiritual and psychological world of eighteenth-century Prague Jews. All Landau's rabbinic writings are utilized in this book, as well as a variety of archival and published German, Yiddish, and Hebrew sources. By unraveling and examining the many diverse threads that were interwoven into the fabric of PragueA s eighteenth-century Jewish life, this study offers a more complete portrayal of rabbinic culture during the last years that it thrived in one of most important centres of European Jewry. Sharon Flatto is Assistant Professor in the Department of Judaic Studies at Brooklyn College, City University of New York, and specializes in early modern Jewish history, early modern and modern Jewish thought, and Kabbalah. Her research interests include the role of mysticism in seventeenth and eighteenth-century Prague, interactions between early hasidim and mitnaggedim (opponents of Hasidism), and the modernization of Central European rabbinic culture. Professor Flatto received her PhD in Jewish history from Yale University in 2000, after which she spent two years as a Postdoctoral Fellow at Brown University. She has taught courses in Jewish history and thought at Yale University, Queens College, Brown University, and Brooklyn College. The recipient of many awards and grants, she has contributed to learned journals and written articles for the YIVO Encyclopedia of Jews in Eastern Europe.